Cream Base card with backing paper from Papermania Signature Collection 'Blueberry Hill'. Image is Malcom Mouse from Digi Stamp Boutique which was a freebie a long time ago. Pastel shapes were cut with nesties. Pastel Ribbon is from U-create. Pastel heart shaped borders were punched from Martha Stewart Lace Heart Punch. 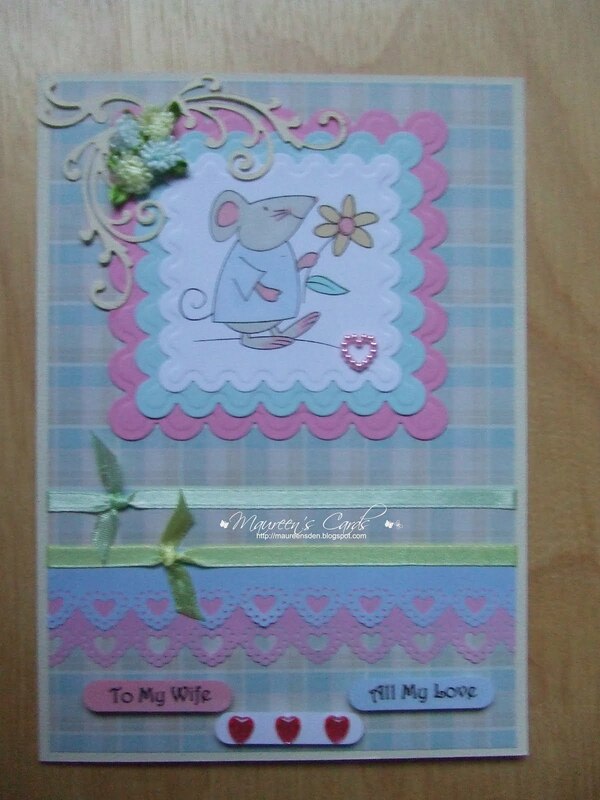 Pastel sentiments were done on PC and coloured with Promarkers and punched with Stampin Up Word Punch. Flourishes were Marianne Creatable Dies. Gems were from my stash. 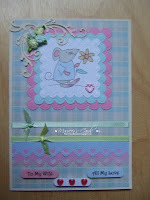 I am also entering this card into Lothian Crafts Online Challenge for Pastel Colours.